One of our local parks is very popular. In fact the area receives so many visitors that it requires special considerations to help manage usage. In other words, the park has a lot of rules. Many years ago, the park posted signs of the rules in the form of a "no" list. Each entry started with a big "No". There was a No this and a No that. I thought the presentation of the list was comical, but the rules were needed to protect the lands. To those of us who visit the public lands with respect, are gracious for the opportunity to use the lands, and avoid causing damage, a "no" list might not be absolutely necessary, but to those who are only users - a list and someone to enforce the list is required. In this sense, the user is really a misuser. Their actions show no regard to preservation. Before we visit any public lands, we try to find if there are any special regulations for the area. For example: Do they allow dogs? What are the camping regulations? Are all areas open? etc. 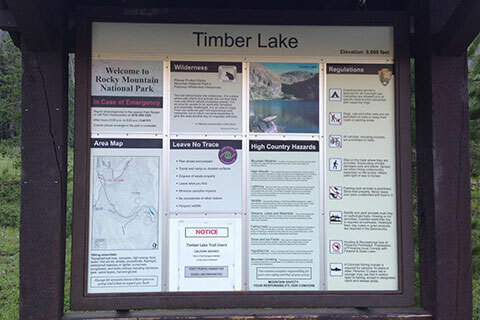 The rules and regulations are often posted at the trailheads, or are available at visitor centers, online or by simply calling the headquarters. It is the visitors responsibility to know and follow the regulations whether they are posted or not. Rules maybe specific to one Park. Our popular local park has odd rules such as no food, no dogs, no running on the trails. When we visit the park we follow the rules. Many rules are reactive. A problem existed and the rule was then posted to address the issue. In a privy in RMNP there was a sign near the toilet that forbid entry into the holding tank. It wasn't hard to imagine why the rule existed, but it was hard to believe anyone violated it, whether is was posted or not. Most rules and regulations are established to prevent damage to the land or to prevent disrupting other visitors experiences. Some rules require education to ensure compliance. On a trip to a National Park with a group of State Park Rangers, one campsite received a warning ticket for leaving a water bottle on the table. The campsite regulations were even posted on the table. My friend just didn't think there was anything wrong with leaving water containers out and so unthinking, he left his on the table. At the time I agreed that it was an odd rule, but then later at a backcountry campsite in a National Forest, we had a bear raid the camp while we were climbing. The bear clawed holes in two water bags, which had never had anything in them other than water! After that bear incident, the National Park rule made more sense to me. Perhaps their posted regulations should have also educated by stating something like - Bears are attracted to water containers (etc). Please store containers properly. Even though a rule might not be enforced, it still needs to be followed. For example, we have always kept a clean campsite, but after recent bear encounters, we are even more aware of our actions that might attract bears to a campground. We definitely bear proof our site. We are also aware of surrounding campers who do not bear proof their sites, even though it is a posted requirement. What is confusing is the campground host or manager allowing food to be left out on the table overnight. Other campers see that the inconvenient rule is not enforced and soon many campers do not bear proof their sites. We also need to be good examples by following the rules. We have a Yeti cooler that when locked, it is bear proof. Still, we do not leave the cooler out at the campsite because it would set a bad example. Most folks (including the campground host and rangers) would not know that the cooler was bear proof. They would look at the Yeti as just a cooler.